When my husband and I moved to a small town in the heart of what is known as the Sacred Valley of the Incas, with mountain and glacier vistas of the Cordillera Urubamba, the purpose was to get out of the city (we’d been living in Lima) to offer a decent quality of life for our larger than apartment-sized Rhodesian Ridgeback pup, and to enjoy a quieter lifestyle ourselves in which we could write. We rented a house on the edge of the town of Urubamba, which came complete with a mature micro chakra (garden with fruit, vegetables, herbs and a wide variety of flowers) and instant country walks along the irrigation canals within minutes of our doorstep. Instead of writing during the first several months here, I became increasingly enamored with the garden, spending copious hours in it daily, planting new herbs, vegetables, and flowers, and obsessing about keeping it watered – no small feat during the valley’s dry season from May through November. Rosa Flores - her real name! Almost every day, the chakra yielded new surprises for me –a lifetime city dweller for the most part, whose only “garden” consisted of copious indoor pots– and I became increasingly interested in the huge variety of flowers available in the Andes, which grow with relative ease and many of which –such as fucshias and nasturtiums— brighten gardens across the planet, but originated in this part of the world. Not being a botanist, I began researching those already growing in my garden to learn their names and about their care. After buying more new varieties from my organic vivera, who is blessed with the delightfully appropriate name of Rosa Flores, I began musing about which varieties were edible. I’d spent a couple of weekends years ago at the Sooke Harbour House on Vancouver Island, where their kitchen garden is filled with edible blooms and most, if not all their five-star dishes feature blossoms at least as garnishes. 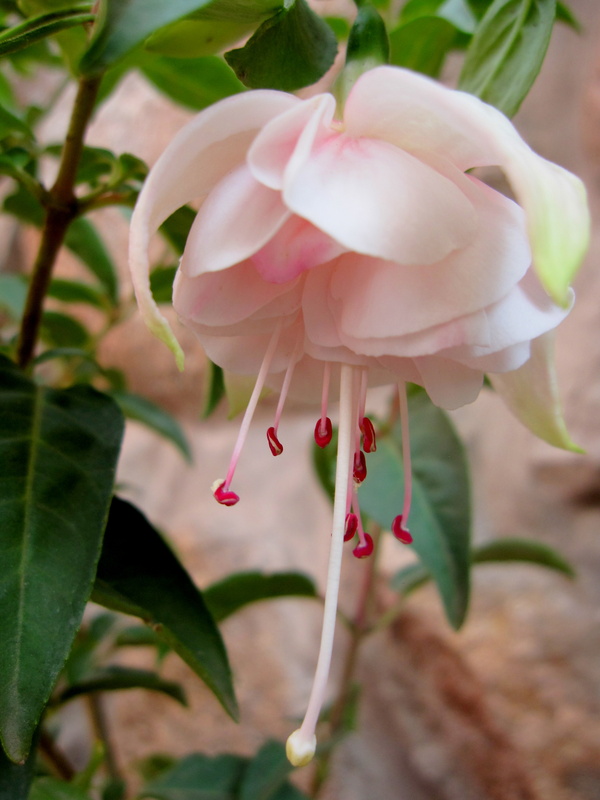 That thought led to more research and I discovered to my utter delight that I was already growing more than 20 varieties of edible flowers in my 3,000-meter high garden, midway between Cuzco and Machu Picchu. In the meantime, after two decades of work experience in the field of international development, I was able to observe from the ground some of the issues facing the Quechua people who dominate this part of Peru. In particular I became aware of the older Andean women, widows with aching bones from carrying countless babies on their backs from dawn to dusk. And now, their own children grown and often lured away by the lights of the cities, they still trudge sometimes 20 kilometers to the market days in town, carrying whatever meager crop is ready for harvest perched on tired shoulders, while their weary faces tucked beneath stovepipe hats make imposters of the cheerfully bobbing mantas. They hope to sell a kilo of carrots or handful of rocotos or sad strawberries before making the uphill journey home at sunset. 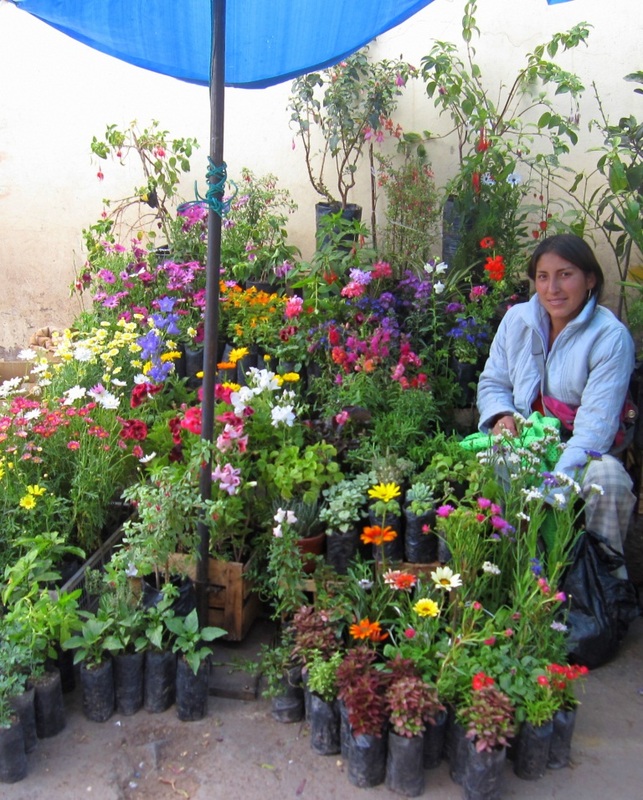 I began devising a plan to market organic edible blossoms to the high-end hotels and restaurants in Cuzco, Machu Picchu, and the valley between that would benefit local women, many of whom subsist on incomes of 3 soles a day or less (a little more than $1). Read more about it in The Project.